This afternoon I attended the Re-freshers Fayre at Dundee University. I was helping the Labour Club there. It was good to get the opportunity to speak to young people who are interested in politics. I am always happy to help students who live in the West End. To find out more about the Labour Club visit their website. This morning I attended a short service and commemoration at the Workers' Memorial Tree close to Discovery Point. This was arranged by Dundee Trades' Union Council and was addressed by the Moderator of the General Assembly, the Right Reverend Bill Hewitt. The event showed the contribution that trade unions and faith groups can make to society. The Moderator highlighted the work of the Church and Society Council of the General Assembly which as I have said before is well worth having a look at. The photograph shows Bill Hewitt speaking at the event. This afternoon there was a meeting of the City Council's Scrutiny Committee. This was an interesting meeting which gave us the opportunity to hear about a great deal of good work in the council's Social Work department. I was particularly interested to hear about throughcare and after care housing support service for looked after children. This is an area which the council and elected members in particular should pay great attention to. Collectively, councillors are the 'corporate parents' for these looked after young people. Therefore, we have a moral duty to take seriously our responsibilities and to try to deliver the best outcomes for these young people. I was very interested to hear that Tayside Police are to hold surgeries to listen to the concerns of local people. In the West End the surgery will take place at Blackness Library between 5.30pm and 7pm on Tuesday 9th February. You can read the Tayside Police statement by clicking here. I am really pleased that Tayside Police recognise the importance of listening to local people's concerns. I would urge any local people with concerns either to get in touch with me or attend this event, or indeed both. There will also be an opportunity to make anonymous comments via a leaflet which is being produced. This evening I attended a civic reception to mark the visit of the Moderator of the General Assembly of the Church of Scotland's visit to Dundee. The Moderator is Right Reverend William Hewitt, it was good to meet him and hear a little about his concerns and his experiences of so far on his visit. 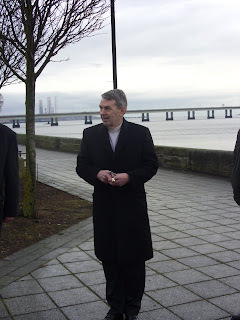 The visit is to the Presbytery of Dundee which is slightly larger than the city of Dundee. Elected members should listen to a wide range of views from the community. Churches and other faith communities have a lot to offer. In a previous job I was an observer member of the Church and Society Council of the General Assembly, politicians should listen to organisations like this. This evening saw a lengthy meeting of the City Council's Development Quality Committee. Unlike recent months this was a relatively long meeting. There were a number of interesting applications considered, none were in the West End though. If you click on the link above you can examine the agenda. This morning I attended a meeting of the Performance Monitoring Sub-Committee of Tayside Fire and Rescue Board. This was an interesting meeting which looked at issues around budgets. Much of this will be reported to the full board meeting on 1st February. The agenda for today's meeting can be found here. The Saltire is flying from the top of the Old Steeple again after several months absence. I am pleased to see the Saltire flying proudly over Dundee once again. I was disappointed that the St Andrew's Cross was absent on St Andrew's Day. I raised the fact the Saltire was ripped in late September I am disappointed that it has taken so long to get a replacement. It is important that the Administration on the City Council take seriously their stewardship of civic and national symbols. There are more serious issues facing the council than flags but it is important that Scotland's flag is treated with respect. I am glad that our flag is flying again.